The Case IH Pro Harvest trailer travels the Eastern states helping local dealerships to keep contractors and farmers up and running in harvest season. 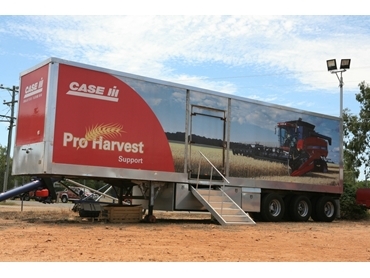 In its fifth year of activity, the Pro Harvest trailer will soon begin its journey south, starting from St George, Queensland, and aiming to stay within 300 kilometers of peak harvest activity. The mobile parts warehouse, carrying over 6,800 individual parts from transmissions to windscreens, gives Case IH dealers in the peak harvest areas fast access to a wide range of parts they don’t normally carry and otherwise have to freight from Sydney. Customers needing repairs can contact their local Case IH dealer who will liaise with the Pro Harvest trailer for part delivery. “Last year a contractor broke down at 10 pm on a Friday night and the local dealership didn’t stock the part he needed. Ordering it from Sydney would have taken a few days. We had the part on the trailer, so he was up and running by lunchtime Saturday,” said Case IH Pro Harvest Support Manager, Barry Lofts. "We’re committed to getting customers back up and running as fast as possible,” concludes Lofts.